For those times when you've wanted to discuss a request with your team while keeping in context with the post. Internal comments are available on our Growth plan and above. You may have seen these in your comments already. Likes are a great way for you and your users to leave lightweight feedback. ​Comment likes are available on all plans. New features are worth celebrating. 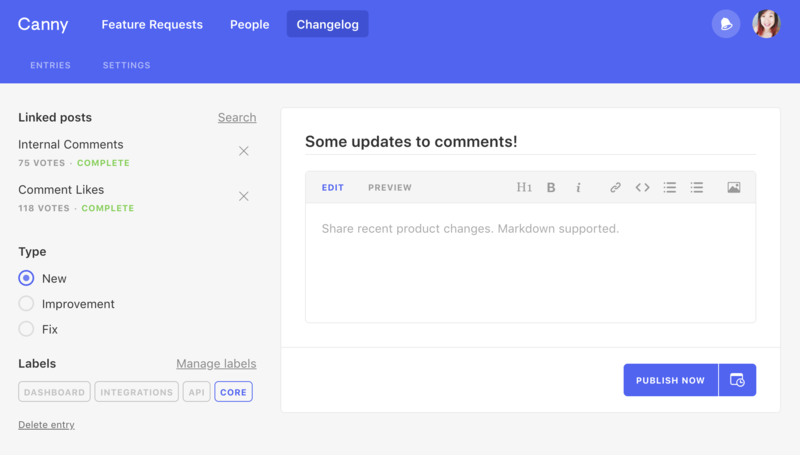 Our new feature, Changelog, is a great way for your team to officially announce product updates. You're reading our changelog update for Changelog! We're currently running a beta so we can iron out any bugs and add highly requested features. Shoot us a message if you want to try it out. From there, you can create your first entry. When you're ready, you can publish the entry right away or schedule it for a later date. You'll now have a single log with all your product updates. We recommend you send out emails to your customers with these updates and linking to the changelog entry. You can also share it to your social channels on Facebook or Twitter. Keeping your customers up to date is great for engagement and bringing people back to your product. The time for feedback is now! If you feel strongly about any missing features regarding changelog, let us know. Enjoy!